Homespun Stitchworks..... For the love of vintage: Threads of feeling ... tokens of fabric left with foundling children in London. 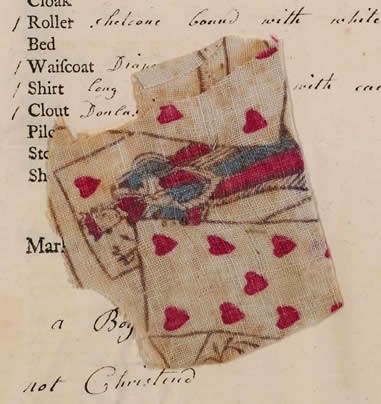 Threads of feeling ... tokens of fabric left with foundling children in London. Should men as strong as Women bind. 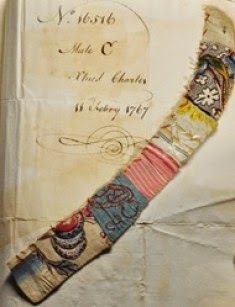 The charity from the beginning tried to keep records and requires a vast 250 mtrs of shelving for the ledgers and entry books, so can not be such a surprise that they also hold 5,000 small textile scraps dating from the middle decades of the 18th Century that are pinned to registration documents. 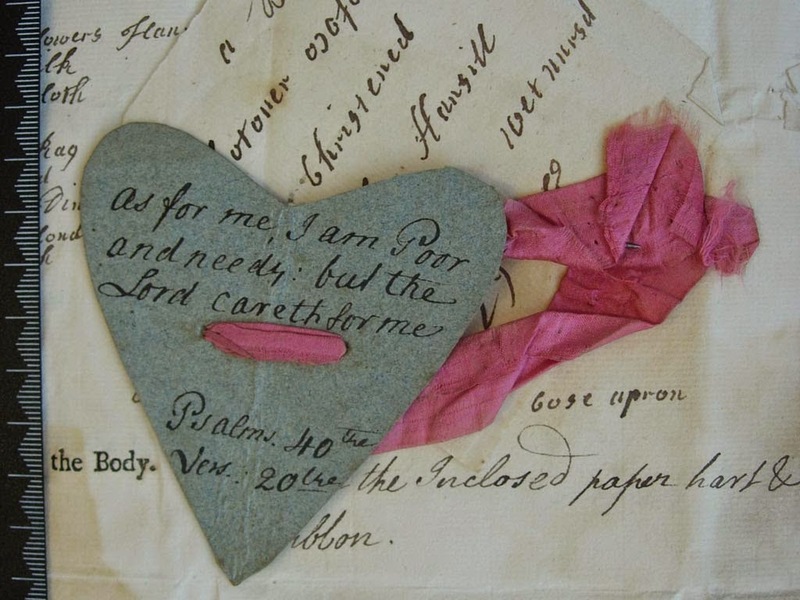 These scraps are both poignant and beautiful, yet sad as it reflects the life of a infant and a mother who had to give up her child. 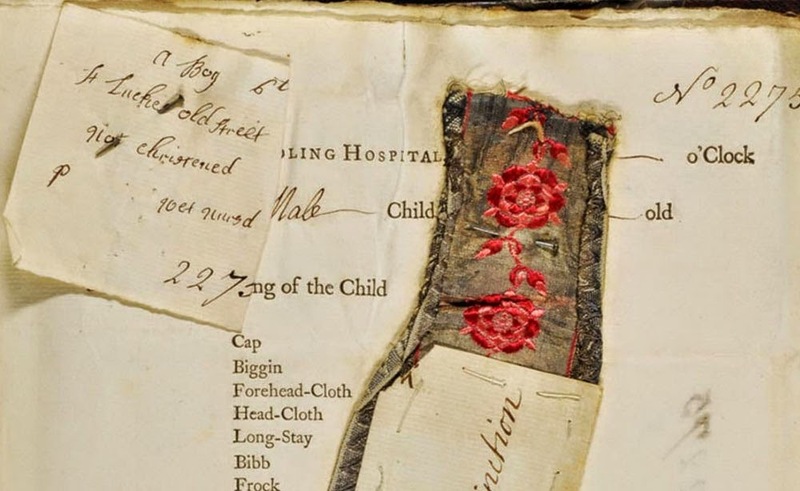 When mothers left babies at London’s Foundling Hospital in the mid-eighteenth century, the Hospital often retained a small token as a means of identification, usually a piece of fabric. 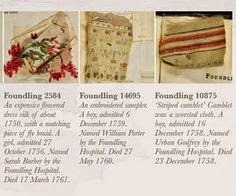 These swatches of fabric now form Britain’s largest collection of everyday textiles from the eighteenth century. They include the whole range of fabrics worn by ordinary women, along with ribbons, embroidery and even some baby clothes. Beautiful and poignant, each scrap of material reflects the life of an infant child and that of its absent parent. The enthralling stories the fabrics tell about textiles, fashion, women’s skills, infant clothing and maternal emotion are the material of Threads of Feeling. 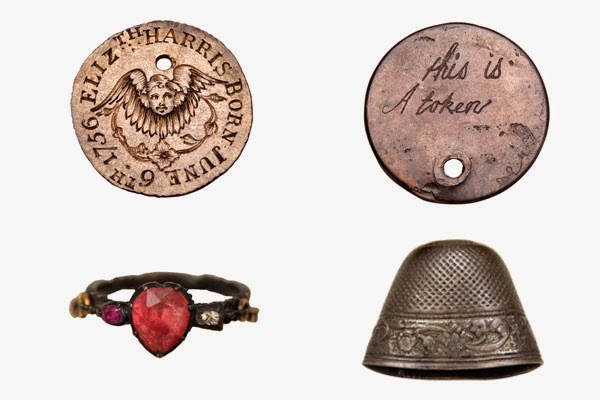 Along with scraps of fabric some parents left little tokens such as thimbles, lock and key, even a small ring as well as little token bits of metal with something engraved on. It must have been distressing to leave your child and the fact that they left it with something from their birth family showed, I think, that they cared but had no choice what so ever. Because of the very well kept records in a time when things were not recorded as they are now we also get an insight into fabrics of the time. 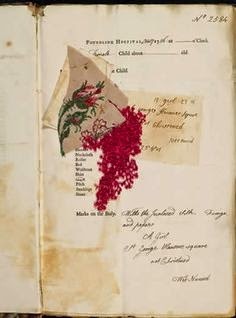 Fabrics that belonged to everyday people and would by now have disappeared and we would have no knowledge of. Occasionally some children had some home embroidery or stitching attached to them which you can only assume that their birth mother had stitched. There were bits of patchwork, Dorset buttons, samplers Some of the identified stitches included satin stitch, chain stitch, crewel work and black work. 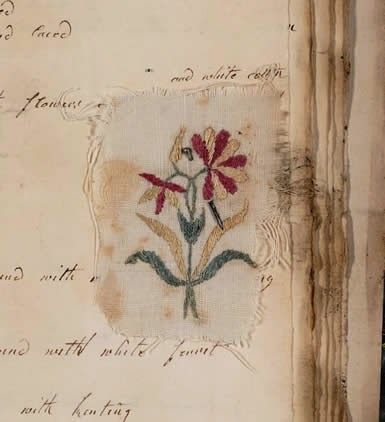 The needlework was often a little crude on the decorative front among the foundling textiles and this suggests that the needle skills of the working women were not as good as once thought. They stitched for their family, clothes and bedding and they mended but obviously did not have the time or the money for the materials to produce decorative pieces just for show. Also they were taught weaving and knitting rather than stitching as it often this was better for work purposes later on. This is an embroidered sampler attached to foundling 14695, a little boy admitted on 6 December 1759. 'worckt with flowers' linen or cotton with flowers attached to foundling 14084 a little boy admitted 3 October 1759. I myself will be making a visit to the museum in the next few weeks as this has touched my heart and taken a grip of my interest. 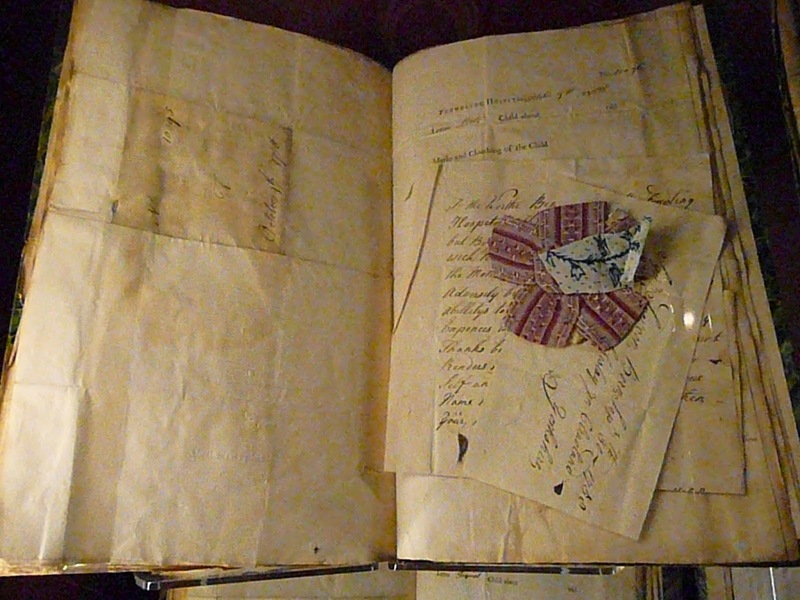 A flowered silver ribbon with a paper sewn to it which reads. Foundling 2275 a boy admitted 6 September 1756. Flowered all over with cards. cotton or linen printed with a playing card pattern. Foundling 14922 a boy admitted 24 December 1759. I will leave you with this last picture and a happier note. and the initials SC and cut in half. Foundling 16516 a boy admitted 11 February 1767. Christened Charles, but given the name Benjamin Twirl by the hospital. Reclaimed by his mother, Sarah Bender on 10 June 1775. These are so beautiful but so heartbreaking. Thanks for sharing. Thank you, I felt that it was interesting and yes heartbreaking. I had not heard of the threads of love until recently and thought I could not be the only one. Interestingly for you New York have some of these as well... So I must find out about that. Thank you as always and I am glad you are enjoying my blogs. Keep warm in that Boston snow! Thank you all so much all, I am pleased you have enjoyed. Hello! You should add a link to part 2 at the end of this post and a link to part 1 at the end of the other. They're a bit difficult to find, and well worth reading. Thank you. Thank you that is a great idea ... will have a go! The grand story, isn't it? I trusted write my essay editors on stories. And it's really touching and interesting topic. So I plan to publish this essay on my blog. It is very interesting to read you! Thanks! I can share with you with my favourite writing service I usually use https://paidpaper.net/thesis-writing/ if you want. In our days there are a lot of scams and substandard essay writing services. Not so easy to choose among them the worthy candidate to write your essays or document. On my point of view, such a service should offer at least good quality and affordable price, as for me I use https://academic-consultants.com/case-study/ and I recommend it for every student. So nice article, sweet sketchbook. If you want for your blog a few good already written articles, you may order it here best research paper. Nice resource and a good way to free up your time for your needs, which is very useful for students and not only. Check and use if you will need it some day. Good luck!